Falvey Memorial Library :: Gavin Wilk on Joseph McGarrity and the Militant Irish Republican Networks in the U.S.
Gavin Wilk on Joseph McGarrity and the Militant Irish Republican Networks in the U.S.
“The Joseph McGarrity Collection at Falvey Memorial Library provided a fantastic variety of complementary material to McGarrity’s papers at the National Library of Ireland,” says Irish scholar and Villanova alumnus Gavin Wilk, PhD. Dr. Wilk, who received his bachelor’s degree in history from the University in 2000, visited Villanova on February 20. During his talk, he mentioned his use of the McGarrity Collection in Falvey. Dr. Wilk returned to campus to present “Resolute Revolutionaries: Joseph McGarrity and the Militant Irish Republican Networks in the United States, 1922-1940.” His talk was sponsored by Irish Studies, with support from the History Department and Graduate Studies. He received his doctorate from the University of Limerick, Ireland, in January. While attending the University of Limerick, Dr. Wilk was an Irish Research Council for Humanities and Social Sciences Government of Ireland Postgraduate Scholar. For his dissertation Dr. Wilk conducted research in Ireland, Great Britain and the United States. Dr. Wilk explains, “The Joseph McGarrity Papers at the National Library of Ireland offered a large amount of material for my thesis, including personal correspondence and Clan na Gael records.” The Clan na Gael was an American-based militant Irish republican organization. About Falvey’s McGarrity Collection, Dr. Wilk says, “Included in the collection are photographs and sketches of IRA veterans who had emigrated to the U.S. The collection also holds some correspondence between Joseph McGarrity and certain IRA veterans, which provided further context for my thesis.” Dr. Wilk returned from Ireland to Villanova to use the McGarrity Collection as part of his dissertation research. 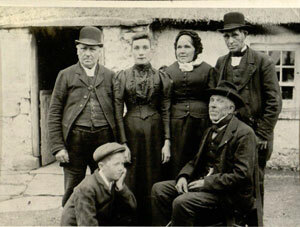 The McGarrity family in Carrickmore, Tyrone, Ireland. Joseph McGarrity (1874-1940) was born in Ireland and came to Philadelphia at age 16. 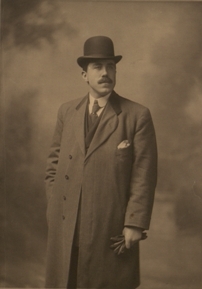 McGarrity became a businessman but had a strong interest in enabling the Irish to free themselves from British control. He was a leader of the Philadelphia Clan na Gael and supported other organizations and individuals working for Irish freedom. The Special Collections’ McGarrity Collection was donated to Villanova University in 1940 by Joseph McGarrity. The collection consists of books and journals focusing on Irish history, literature, folklore, travel, music and Irish-American history. Also included is an archival paper collection, The McGarrity Papers at Villanova (Group I). A second collection of archival papers, The McGarrity Papers at Villanova (Group II), was donated to Falvey in 2000 by heirs of McGarrity’s oldest daughter, Mary McGarrity Shore (1912-2000). These archival collections include correspondence, financial records, photographs, pamphlets, Clan na Gael records, diaries, notebooks and other material. Falvey’s Special Collections contains approximately 15,000 items. Villanova University faculty, staff and students, and visiting scholars and researchers may use Special Collections during scheduled hours or by appointment. Michael Foight, Special Collections and Digital Library coordinator, and Bente Polites, Special Collections librarian, staff Special Collections. Also contributing: Luisa Cywinski, Laura Hutelmyer, Judy Olsen and Bente Polites; photographs courtesy of the McGarrity Collection.